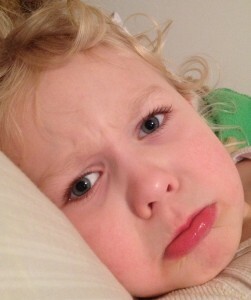 Is Your Toddler’s iPad Keeping the Sandman Away? If you are a card-carrying member of the Parent’s Club, you know full well that you do NOT mess around when it comes to your toddler’s sleep. I don’t care if the guy from Publisher’s Clearing House is banging on my door with one hand and carrying a gigantic paper check for one million dollars in the other; if it’s bedtime for my little ones, I’m not answering the door. I’m pretty laid-back when it comes to changing up our normal daytime routines, but when it comes to the Put The Kids To Bed So Mom Can Have Some Free Time routine, there’s no room for deviation. 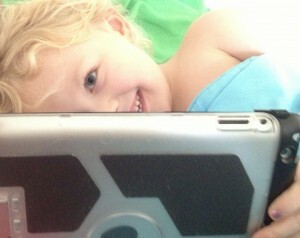 In our house, the iPad has its part to play in putting our 2 and 5-year-olds to bed. Daddy will use it to read books, and I like to cuddle up with my girls and funny YouTube videos. 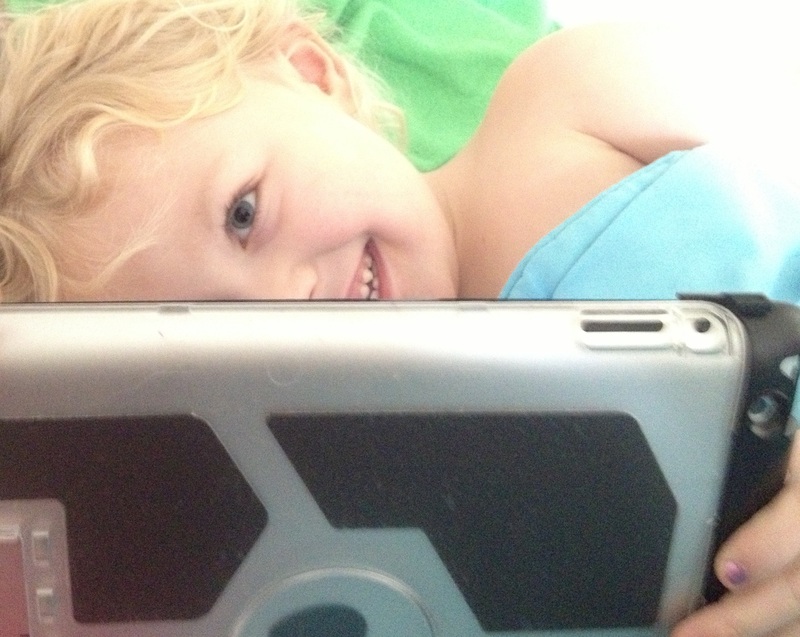 On the nights when one of them is not feeling sleepy, we will allow them to play with the iPad in bed. I hear some of you gasping in horror. However, I know most of you can relate. Huh? Let me break it down for you. The screens from televisions, some tablets (iPads included), and mobile phones emit a blue light. Apparently this blue light has been shown to suppress the production of a brain chemical called melatonin, a chemical which happens to play a very important role in helping us fall asleep. Our bodies associate blue light with daytime since this kind of light is especially prominent in daylight. In fact, exposure to blue light can make us feel more alert. Alert, however, is not something most of us want our children to be at bedtime. By now you’re probably saying, “But I don’t let my children use the iPad for two hours before bed! That’s crazy!” Yes, I agree. However, how many of us turn on the TV after dinner, maybe a little family movie night, then end the evening with stories or playtime on the iPad? Do the math and you might have to humbly admit that you reach the two-hour mark. I know we often do. It turns out there are measures you can take to decrease the levels of blue light your children are exposed to. The most obvious one: You can put the iPad to bed a couple hours before the children. Hahahahaha! Gotcha! Just kidding! Well, I mean, I guess you can, but let’s be honest: You want to chill out on the couch in front of some bad TV, maybe even go to the bathroom without an audience, NOT deal with a crying and screaming toddler for the better part of your night. Without a doubt I believe almost all of us could do with less screen time. If there’s a part of you that feels the same way, definitely step up and give the screens in your home a bedtime. If you really want to get the kids involved, make it their job to put the iPad to bed. Think of the fun the little ones will have pushing the power button, putting it on a pillow, and covering it with a blanket. If the iPad continuously finds its way into your child’s bed at night, though, you might want to consider changing the brightness level, thus decreasing the level of blue light emissions. The dimmer the display, the better. It just so happens that there is a super quick way to adjust your iPad’s brightness. If you don’t already know how to do this, you’ll be amazed. It’s easy as parents to have a knee-jerk reaction to news reports warning us of some danger to our children. Keep in mind that problems sleeping have been around long before the proliferation of electronic devices. Rarely is there one sole culprit. It just so happens that some of us are genetically more sensitive to the effects of light exposure than others. Some of us are night owls, including our children. Ultimately, I believe that my 2-year-old falls into the nocturnal fowl category; however, I have a feeling that an experiment in early-screen-bedtime is in her future. You’ll know when. You’ll hear the screams. 4 Responses to Is Your Toddler’s iPad Keeping the Sandman Away? Loved it! Great writing and useful tips.